Are you planning to go camping this summer? I am excited to be teamed up with the host and wonderful bloggers to bring you this camp kitchen giveaway! It is everything you need to prepare for the outdoors. 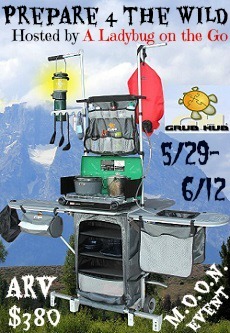 The Grub Hub makes is it easy to prepare for your next trip then keeps everything organized at the campsite. All outdoor cooking necessities are right at hand when needed. Sturdy tables, stove platform, light tower, large main storage compartment and multiple organizers make outdoor meal preparation a pleasure. Built-in features like the utensil rack, air dry bags and collapsible sink simplify camp chores. All components are engineered for extended outdoor use in all weather conditions. ONE (1) lucky winner will receive a Grub Hub USA Camp Kitchen ARV $380! Contest is open to US only, 18+ (ends June 12th, 2013 at 8pm CST). All entries will be verified. Winner will have 48 hours to respond to claim their prize. Good Luck!